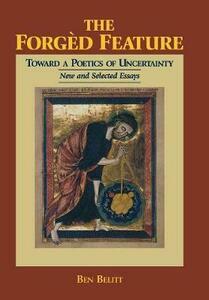 The scope of The Forged Feature is two-fold: to bring together a representative selection of critical essays bearing on Belitt's interests as poet, critic, teacher, and translator; and to furnish an on-going review of his concern with the encoding of languages and the exigencies of their imaginative retrieval. The collection begins with three pieces on the uses of belief, linguistic and place as shaping forces in the concretizing of the literary artifact. The second section of essays examines the fictive medium in terms of a number of "predicaments." The discussion embraces texts such as parables, novels, and autobiographical meoirs covering a broad range of twentieth century talents: Kafka, Borges, V.S. Naipaul, Saul Bellows, and Pablo Neruda. The third section is devoted to the theory and practice of translation developed from Belitt's personal lifetime of experience. Finally, there is a sequence of four essays on the uses of "new physics" of quantum mechanics and its uncanny relevance to the accountability of poetry. Belitt re-evaluates Gerard Manley Hopkins as a "scientific" rather than a priestly crafter of a medium, and touches upon diverse traditions and talents such as Keats, Blake, Stevens, Bishop, Yeats, Baudelaire, Rimbaud, Cocteau, W.C. Williams, Michado, Rilke, Wordsworth, and Coleridge. The brilliant observations collected in this volume are not contained within a specific school of thought and are indefinable within any current fashion- rather, Belitt's frame of reference is literature itself and his essays proceed in a literary, poetic, and individual voice.